What photo takes you right back to Istanbul? We visited so many historic mosques in Istanbul and Blue Mosque was one of our favourites. Summarise Istanbul in three words. 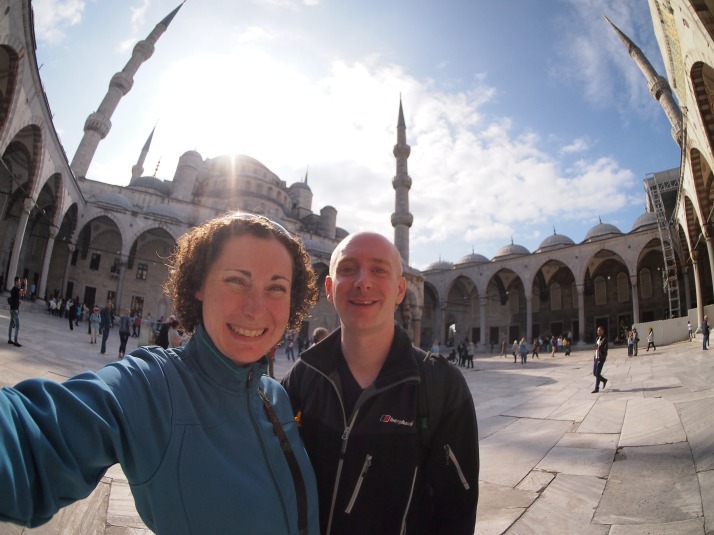 Strolling – Our guidebook of choice is usually the Lonely Planet but Strolling Through Istanbul was perfect for us – we love walking tours, it covered the main sights in much more detail than the LP and was extensive enough that we could use it to get off the beaten track as well. On the downside it wasn’t at all helpful with information on how to get to the start of the walks and the maps could have been clearer. Mosques – It feels like there’s a mosque around every corner in Istanbul and their domes and minarets (towers) are easily spotted landmarks. When we thought about it though, the density of churches in London, Paris, Venice or York is probably just as high. Steep – There are lots of hills in Istanbul and streets are often cobbled which makes the going even harder. Most of the places we stayed were accessed only by spiral staircases (no lifts). …you can spend the morning in Europe and the afternoon in Asia without even leaving the city. What one item should you definitely pack when going to Istanbul? Ear plugs. With so many mosques in the city you’re bound to be sleeping within range of one and the first call to prayer is at dawn, which was about 4.40am after the clocks went back. We quite liked the sound of it but maybe not so good if you’re a light sleeper. This entry was posted in Places and tagged Istanbul, Round Up, Turkey on November 19, 2014 by Julie. What is 11 + 34 ?